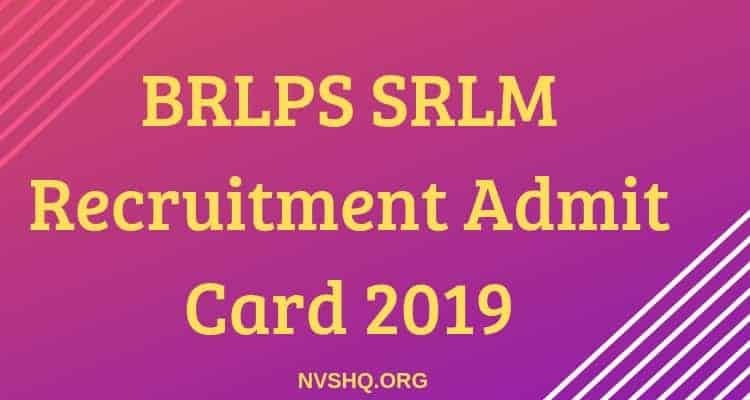 BRLPS SRLM Recruitment Admit Card 2019: Bihar Rural Livelihoods Promotion Project Society (BRLPS) under the framework National Rural Livelihood Mission (NRLM) has recently invited application for the recruitment of 3409 suitable candidates for various positions required in the project. The application procedure has been completed on 15th April 2019. As the selection will be made on the basis of an online written test, applicants are waiting for the release of BRLPS SRLM admit card. With the valid admit card they will be able to write the test. Admit card for the recruitment exam will be published soon on the official portal of the project. Candidates have to download it by using their valid login credentials. 2 How to Download the BRLPS Admit Card? Admit card is one of the important documents to be carried to exam hall during exam days. It is the entry pass that helps candidates to enter the exam hall and write the exam. Admit cards provide information about the exam date, time and exam center. Without a valid admit card, invigilator at the exam center will not permit any candidate to appear for the exam. All the candidates who are going to appear in the coming BRLPS recruitment exam are advised to download their hall tickets on time. They should not think that they will download the same one day before the exam or on the day of exam. Candidates may face problems at the last moment that may arise due to internet connectivity issues, server problems, and various other technical glitches. Therefore, it is better to print the hall ticket as soon as possible before the exam. How to Download the BRLPS Admit Card? Step 1- Go to official portal http://jobs.brlps.in. Step 2- Click on the admit card link. Step 3- Admit card login page will appear. Step 4- Enter the registration no, password and other required credentials. Step 6- Admit card will be displayed on the screen. Step 7- Check all the information mentioned on it. Step 8- Download and print the same and keep it safe. Examinees are advised to verify all the details printed on admit card properly before going to appear for the selection test. In case they find any discrepancy or issue related to the admit card they need to immediately contact the concerned person for rectification. If candidate’s identity is found to be in doubt, then he/she may get debarred from the exam. A valid printed copy of hall ticket. Candidates have to submit call letter along with the photocopy of identity proof to the invigilator in the exam hall. Any candidate failing to submit the id and admit card or if their identity is found to be in doubt then such candidates will not be allowed to appear for the test. Admit card for the online written test will be released at least one week before the date of exam. Hall ticket can be downloaded only by the registered candidates. It can be accessed only through the online mode as no printed copy of admit card will be made available to any candidates. Candidates should be ready with valid login credentials in order to download the admit card.